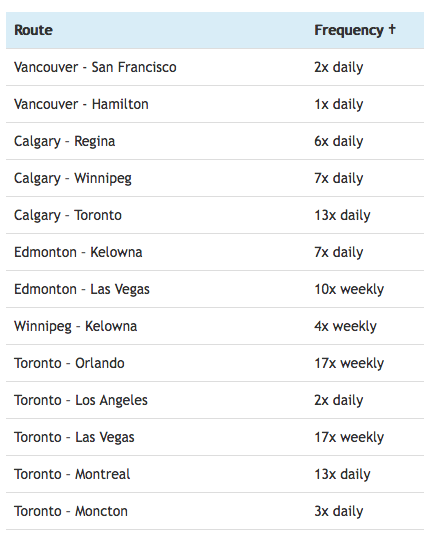 WestJet released their summer flight schedule today with lots of additional frequencies on their popular routes but possibly the biggest surprise is a new twice weekly route between Calgary and Nashville. Yes they are both country music hubs so there is similarity there but it still is a bit of a surprise. Our guess is that enough Western Canadians were connecting to the WestJet Toronto-Nashville flight to warrant this new direct flight. Additional flights from Toronto to a number of Canadian and international destinations including Orlando, Los Angeles, Las Vegas, Montreal and Moncton. An increase of four new weekly flights between Vancouver and Hamilton, as well as the addition of a daily flight to San Francisco. Service from Calgary will increase with six additional weekly flights to Toronto, and the addition of a once-daily flight to both Winnipeg and Regina. Service from Edmonton to Kelowna will increase by 12 weekly flights and by one additional weekly flight to Las Vegas. Service from Kelowna to Winnipeg will increase by one weekly flight for a total of four times weekly. Extension of existing winter service increases through the summer, including six daily flights between Vancouver and Kelowna, and five daily flights from Vancouver to Prince George.